When Walter Stahl was five-years-old, his mother drove away in the family’s blue Volvo and never came back. Now seventeen, living in the dregs of Las Vegas, taking care of his ailing father and marking time in a dead-end job along the Strip, Walter’s life so far has been defined by her absence. He doesn’t remember what she looks like; he’s never so much as seen a photograph but, still, he looks for her among the groups of tourists he runs into every day, allowing himself the dim hope that she might still be out there, somewhere. But when Walter meets Chrysto and Acacia, a brother and sister working as living statues at the Venetian Hotel, his world cracks wide open. With them he discovers a Las Vegas he never knew existed and, as feelings for Chrysto develop, a side of himself he never knew he had. At the same time, clues behind his mother’s disappearance finally start to reveal themselves, and Walter is confronted with not only the truth about himself, but also that of his family history. Threading through this coming-of-age story are beautiful, heart-wrenching graphic illustration, which reveal the journey of Walter’s mother Emily: how she left everything to chase a vision of Liberace across the country; and how Walter’s father Owen went searching for her amongst the gondolas of the Venetian Hotel. 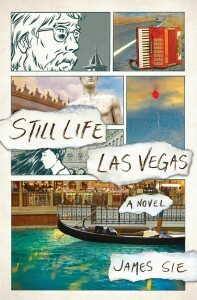 In James Sie’s debut novel, Still Life Las Vegas, the magical collides with the mundane; memory, sexual awakening and familial ties all lead to a place where everything is illuminated, and nothing is real.